We have another Majora’s Mask fanart update in the image gallery for you all to enjoy, and once again we have some wonderful pieces. This time we have some more diverse mediums of art submitted, including the impressive craft piece you can see to the left. Our Fan Projects Gallery has a lovely 16 new additions this time around, and you can see a bigger version of all of our wonderful pieces by clicking the links below. 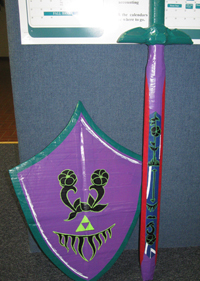 Great Fairy Sword and Shield – Felicia S.
Happy Mask Salesman – Jeffrey C. D.
No Face – Jeffrey C. D.
Moon – Jeffrey C. D.
Moon 2 – Jeffrey C. D.
The Curse of Majora’s Mask – Dana F.
Beautiful pieces all of them. Remember you can comment on each piece in its individual gallery page. Thanks to everyone who has submitted so far, and I encourage you all to continue submitting your own pieces as well. Anyone who wants their Majora’s Mask fanart featured can do so by emailing their piece to me or by posting in our MM Month Fanart Project thread at the forums.